Originally planned to enter mass production in the second half of 2016, Intel’s 10 nm process technology is still barely used by the company today. Currently the process is used to produce just a handful of CPUs, ahead of an expected ramp to high-volume manufacturing (HVM) only later in 2019. Without a doubt, Intel suffered delays on its 10 nm process by several years, significantly impacting the company's product lineup and its business. Now, as it turns out, Intel’s 10 nm may be a short-living node as the company’s 7 nm tech is on-track for introduction in accordance with its original schedule. For a number of times Intel said that it set too aggressive scaling/transistor density targets for its 10 nm fabrication process, which is why its development ran into problems. Intel’s 10 nm manufacturing tech relies exclusively on deep ultraviolet lithography (DUVL) with lasers operating on a 193 nm wavelength. To enable the fine feature sizes that Intel set out to achieve on 10 nm, the process had to make heavy usage of mutli-patterning. According to Intel, a problem of the process was precisely its heavy usage of multipatterning (quad-patterning to be more exact). By contrast, Intel’s 7 nm production tech will use extreme ultraviolet lithography (EUVL) with laser wavelength of 13.5 nm for select layers, reducing use of multipatterning for certain metal layers and therefore simplifying production and shortening cycle times. As it appears, the 7 nm fabrication process had been in development separately from the 10 nm tech and by a different team. As a result, its development is well underway and is projected to enter HVM in accordance with Intel’s unannounced roadmap, the company says. The Intel exec reaffirmed the company plans to start HVM production of client CPUs using its 10 nm process technology in 2019, with datacenter products following on a bit later. That said, Intel is clearly not skipping any of its already announced 10 nm products, but implies that its 7 nm products may hit the market earlier than we might expect today (i.e., four years after the 10 nm). Intel has never disclosed characteristics of its 7 nm fabrication tech, but a major reduction of multi-patterning usage as well as a more traditional 2X scaling goal vs. 10 nm indicates a more extensive usage of EUVL. According to ASML, one EUV layer requires one EUV step-and-scan system for every ~45,000 wafer starts per month. 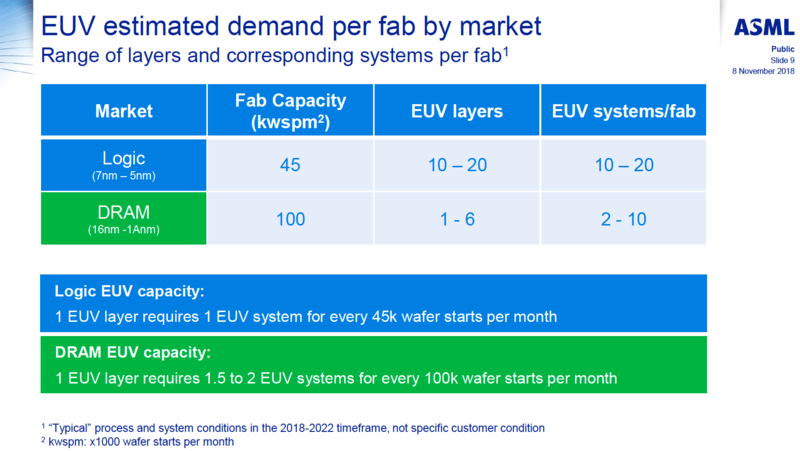 Therefore, if Intel plans to use EUVL extensively for 10 to 20 layers, it will require approximately 20 to 40 EUVL scanners for a fab with a 100,000 wafer starts per month capacity. Considering that Intel is not the only company with plans to use EUVL in the 2020s, getting the number of EUVL scanners it might need for HVM at multiple fabs may be a challenge. Meanwhile, so far Intel has announced plans for only one 7 nm fab: the Fab 42 in Arizona. In addition, the company is going to have some 7 nm-capable capacity at its D1 facility used for development and trials (among other things). "Now, as it turns out, Intel’s 10nm may be a short-living node as the company’s 7nm tech is on-track for introduction in accordance with its original schedule." By original schedule surely they mean an arbitrarily chosen undisclosed schedule and not the original publicly announced schedule. Anyway Intel said 2021 7nm shipment from Fab 42. At least this was the official claim done to Trump. Sure, it could be an internal schedule, but they usually have roadmaps each year that show where these process improvements are generally expected to hit production. Likely the "original" schedule was on a past roadmap. My guess and only a guess - is that Intel has been working on this a while and with all the back lash about 10nm - decide to some serious reorganization in process department and took its current 10nm has a wash. Likely some of staff lost there jobs on this issue. And moving to Ice Lake to new 7nm format - I believe Intel wants a super fast - low power product by 2019.